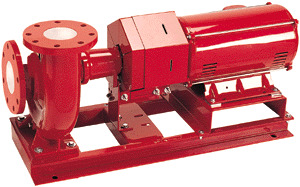 Base-mounted, end-suction Series 1510 pumps are available in 1-1/4 through 8 sizes, 1/2 HP to 150 HP at 1750 RPM and 2 HP through 150 HP at 3500 RPM. Bronze-fitted, all-iron and bronze material configurations are available with flows to 4000 GPM, heads to 500 feet. Integrally cast volute foot and center drop-out spacer coupling combine to offer true back pullout capability, providing low-cost ease of maintenance. An ANSI-OSHA-compliant coupling guard shields the flexible coupler. A welded steel baseplate and internally flushed mechanical seal are standard features on this pump.